Why is it when you need to buy presents there never seems to be that thing that you are looking for, you don't know what it is but when you see it you know that its exactly what you are looking for. I went to the supermarket, wondered around many shops and came back empty handed... I did leave a trail of envelopes behind me. I decided when my sister makes an apperance I will go out with her to a different supermarket to the one I usually go to but I found nothing there either, we went to a few other high street shops and again nothing. Still I managed again I managed to leave an envelope trail behind me. My niece had decided she needed the toliet, on the way back we saw some Jelly moulds which at first I thought were tubs but on a closer inspection I realised they were moulds. I ended up making the mistake of mentioning just that to my niece and with her being a fan of Ben and Holly's magic kingdom she insisted that we needed them as she wanted to have a jelly flood. 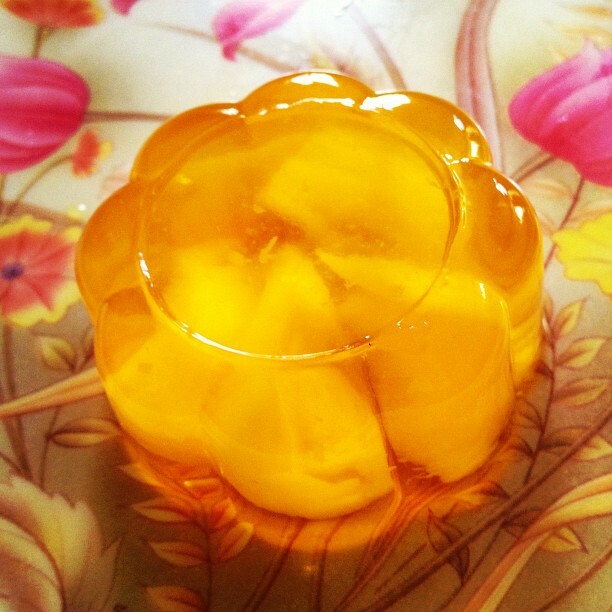 I came home and made some fresh mango (fresh to a point anyway) and mango jelly. I could have continued eating it and my sister who had insisted she didn't want any ended up eating one and a half.... I guess these thing just take us back to our childhood especially to the days of jelly and ice-cream. Yum! What are some of your favourite things to eat? I went to buy some more today and ended up forgetting to get some. I still need to buy presents so it looks like I'm stuck getting plants or chocolate which wasn't my ideal thing. Haha, the other day I bought blue and red jelly to make a special drink for our little niece and I couldn't help scooping all the leftover pieces for myself :p. There's something extremely cool about eating color! Its so true, colourful and messy things are always appealing. I love jelly! In German we call it Wackelpudding or Wackelpeter like wobbling jelly/Peter. Thats really interesting to know so thanks for sharing. This is a typical Pakistani Jelly and can be bought in all kinds of usual flavours, I don't think its suitable for Vegetarians but whatever they use is brilliant as it sets pretty much straight away and is so thick of delicious compared to Vegetarian jelly which is thin and watery (but I still love it). Jelly and ice-cream are always my childhood memories.